Tiffany Aliche, aka “the Budgetnista,” lives an all-cash life: Houses, cars, vacations—all paid for in cash. 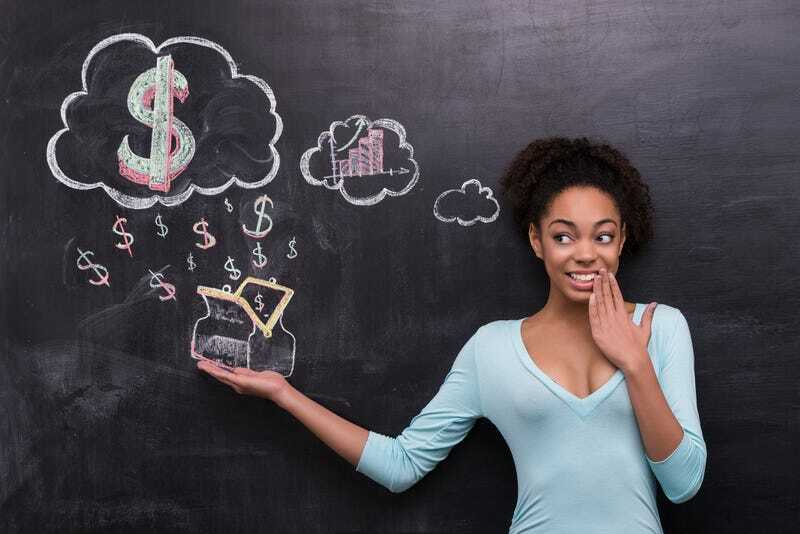 This preschool teacher-turned-women’s financial educator knows that everything you need to know about how to manage your money, you did not learn in kindergarten. She is the author of the Amazon No. 1 best-selling book The One Week Budget: Learn to Create Your Money Management System in 7 Days or Less! and creator of the Live Richer Challenge, a series of 22-day courses, which to date have helped revolutionize the financial habits of more than 500,00 women from all 50 states and 100 countries. And if it takes a village, you can count on Aliche to build one; the Live Richer Challenge comes with a 270,000-strong 24-7 Facebook support group called the Dream Catchers. The Live Richer Challenge starts with creating the “Wealthy Mindset.” Step 1 is calculating the worth of your home—which goes far beyond just the property you own. Aliche asks me, if I were to cash them in today, do I know the value of my jewelry or individual retirement account and insurance policies? Admittedly, I don’t. But insurance and IRAs figure largely in individual net worth. According to the Budgetnista, most policies are worth 50 percent or less if cashed in before term. By day 2, you’ll know your net worth and the difference between being able to pay for something versus truly being able to afford something. Aliche says, “Yeah, you might be able to buy that BMW, but if it breaks down, do you have the money to fix it?” By day 3, you might be ready to snap your wallet shut. Everyone wants to know: How do I get to have more and owe less? Week 2 challenges focus on increasing your net worth by first identifying your skill set to create a side hustle. Aliche cites a Prudential Bond (pdf) biannual survey that reports that African Americans’ No. 1 financial goal is to be debt-free. Aliche is just paying off a $50,000 student loan after consulting with a debt-forgiveness specialist, successfully wiping $20,000 of the bill. The final phase of the Live Richer Challenge is maintenance. Get rid of liabilities and maintain your net worth. What can you do to make sure you don’t get back into debt? Thrift first. “Buying a new car is the biggest waste of money,” says Aliche, who just treated herself to a 2-year-old used car. “A woman gave me permission to soar—to move beyond a six-figure business into an eight-figure business,” she says. What convinced Aliche, who religiously gives 10 percent of her income to charity, was that while she was doing great for herself, there was so much more good she could accomplish. “If I make a million, that’s 100K for my nonprofits,” she says. What’s the endgame? A billion-dollar venture capital business is the next big score for the coach of the Dream Catcher team. Less than 1 percent of minority businesses pass the $1 million mark in funding; a figure Aliche repeats several times, in defiance and disbelief. But one thing she does believe is that she could do an enormous amount of good being the final decision-maker in boardrooms from Silicon Valley to Wall Street, fielding pitches that would revolutionize the African-American marketplace. For instance: What about funding a perm that won’t damage your hair? Here’s the power of a seat at the table: If the money people in the room don’t know your life, they don’t know the potential of your product pitch. Aliche sees the dream: “I want to be on the cover of Forbes: Brown girl. ‘Billion Dollar Business’—with my locs and dark skin.” Now, that’s rich.